Banu Subramaniam: "Tracking Ghosts: Hauntings from a Eugenic Past"
"Tracking Ghosts: Hauntings from a Eugenic Past"
What do morning glory flowers or exotic plant and animal species have to do with the history of race or eugenics? In this talk, Subramaniam will trace the genealogies of ecology and evolutionary biology to explore how histories of gender and race shape contemporary biological theories and what lessons we can learn about the relationships between natures and cultures. 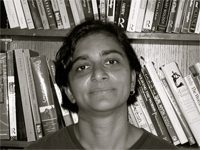 Banu Subramaniam is associate professor of Women, Gender, Sexuality Studies at the University of Massachusetts, Amherst. She is coeditor of Feminist Science Studies: A New Generation (Routledge, 2001) and Making Threats: Biofears and Environmental Anxieties (Rowman and Littlefield, 2005). Trained as a plant evolutionary biologist, she seeks to engage the social and cultural studies of science in the practice of science. Spanning the humanities, social sciences, and the biological sciences, her research is located at the intersections of biology, women’s studies, ethnic studies and postcolonial studies. Her current work focuses on the genealogies of variation in evolutionary biology, the xenophobia and nativism that accompany frameworks on invasive plant species, and the relationship of science and religious nationalism in India.